Cows belong outside, on grass. It’s that simple. Shelley has wanted her own milk cow since she was 10 years old. But cows need space, and there is some time commitment if one is to have a consistent milk supply. Finally in the spring of 2006, all the pieces fell into place. We decided that we wanted a Dexter cow (an old Irish breed that was kept on ancient farmsteads because they are small–about 600 pounds–and dual-purpose, meaning they perform well for milk and meat. The problem is that they are hard to find in the United States, because modern farming methods don’t support a dual purpose animal–they are focused either on high milk production for a dairy, or heavy muscle growth for beef. But, after much searching (and nearly driving to Colorado to pick up a suitable cow) we found one just an hour away in Monroe! Beauty of Windy Acres, at age 13. Her name is Beauty (on her papers she’s Beauty of Windy Acres), and she is beautiful. She is now 18 years old, and her original owner in Oregon had trained her to be a perfect family milk cow in her youth. She was patient and well-behaved while we learned how to milk—those first few weeks the milking took forever, but she has the sweetest, creamiest milk ever. 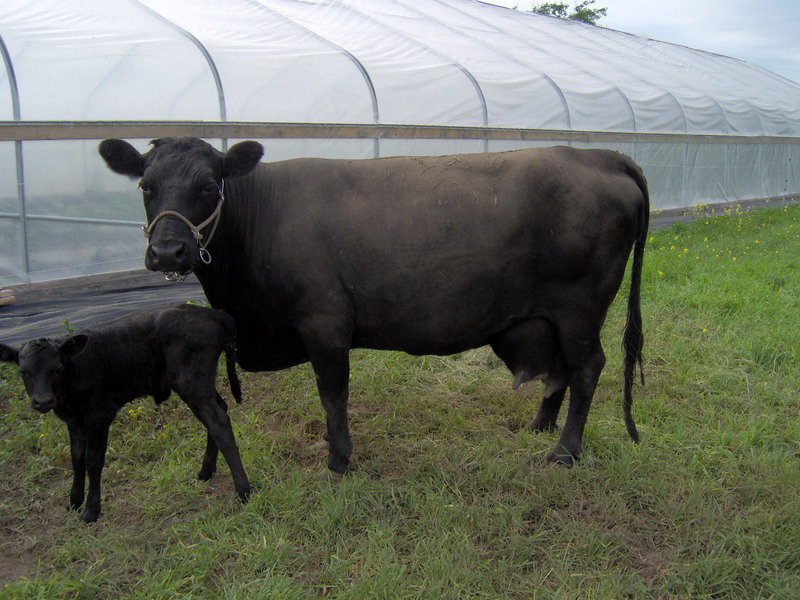 She gave birth to a heifer (female calf) in 2007, who we named Juniper. Juniper had her first calf in 2009, and as Beauty heads into retirement we decided to keep her most recent calf, who we named Dulce, as in Dulce de Leche. (This little heifer’s father was named Taco.) All three girls are due this spring/summer so we will have three calves this year! Juniper with her 3rd calf, Clementine, at 1-2 days old. This is motherly love. Cows are a herd animal and are really at their happiest in a group, so it works out well. Our Dexter cows are the perfect milk animal for our family, giving about a gallon per milking. They are sweet, gentle, and small enough not to eat us out of house and home. Youngsters playing “king of the mountain”. Chester (Juniper’s 2011 calf) is winning, and Dulce (Beauty’s calf) is challenging him. 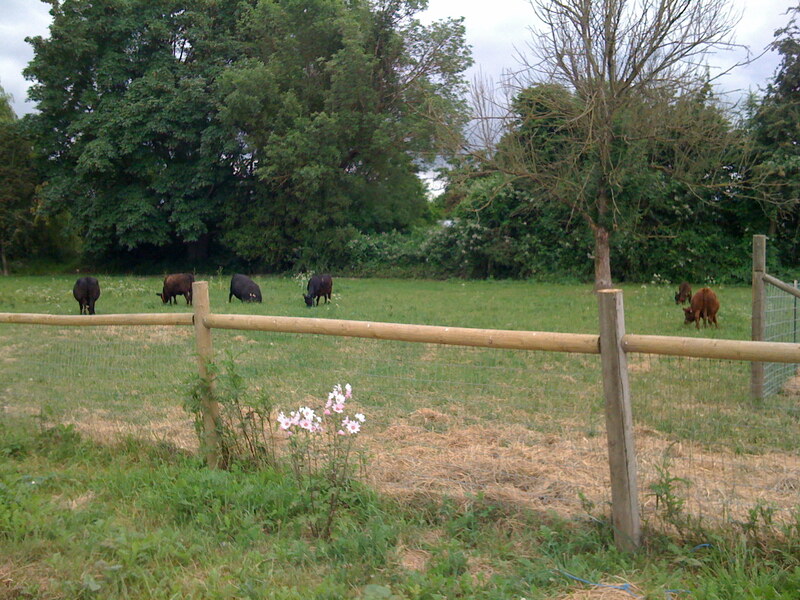 You can visit the cows in their new pasture on the south side of the farm. Cute as a button. 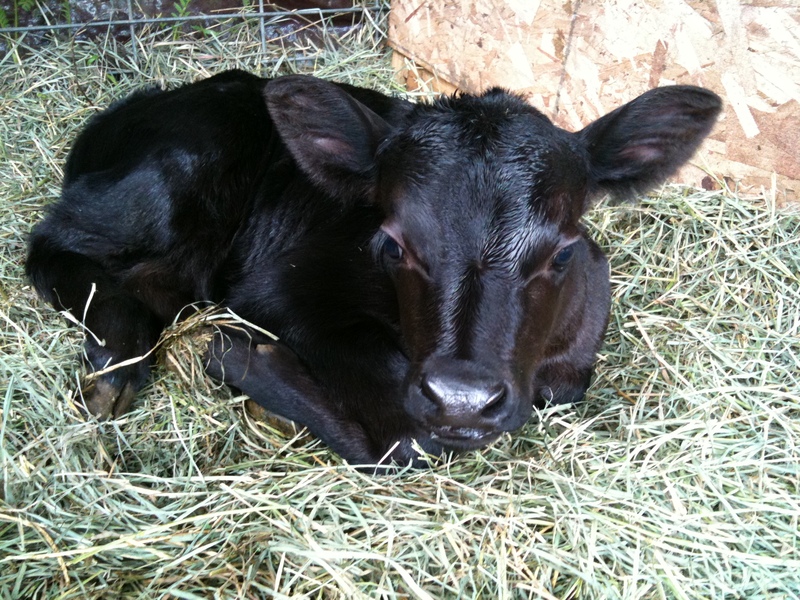 Matilda, Juniper’s first calf. Before we had our own bovines, I really just wanted a cow for milk, and the snuggle factor. When I was growing up my dad always told us wonderful stories about growing up on a farm during the depression. 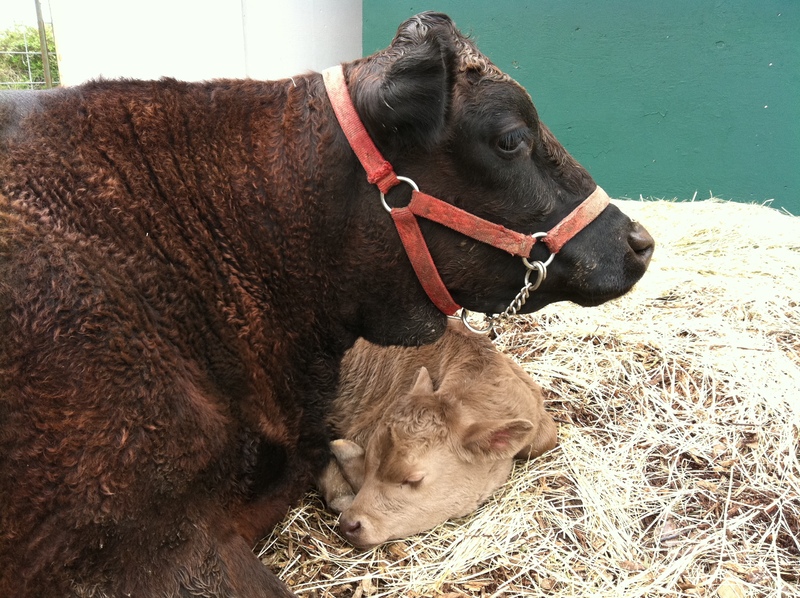 They had a bazillion White Leghorns for eggs, and a pig named Esmerelda, and Bossie the cow–a Jersey-Guernsey cross. It was my dad’s job to milk the cow, mostly because his mom was scared of her. The stories always involved snuggling into Bossie’s flank and settling into the rhythm of milking, squirts of milk ringing into the pail–and hitting the cat. I longed for that experience growing up. After about a week of keeping the cows, it became evident that there was much more to be gained from the beasts than just warm fuzzies, milk, and a beef calf. We are learning how to use our cows in our crop rotation. 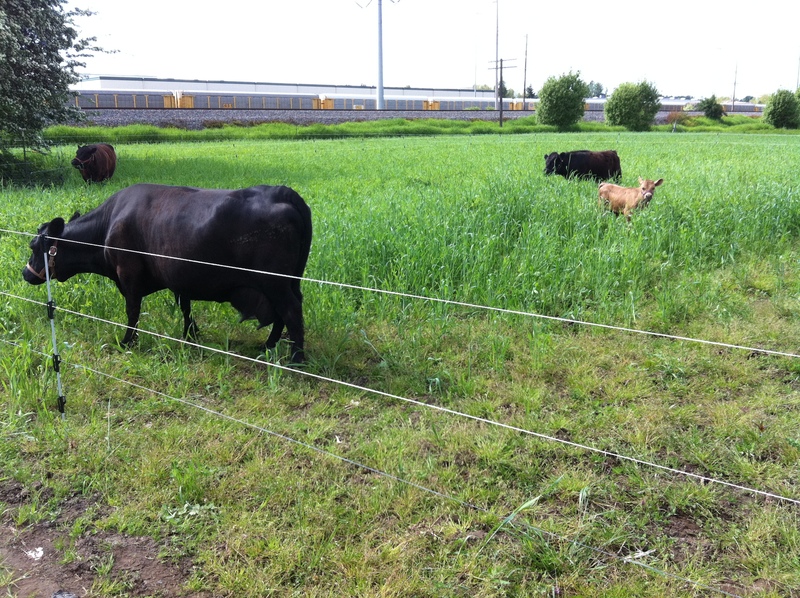 This is a temporary fence set up on an overwintered cover crop of rye and field peas. Manure is gold. 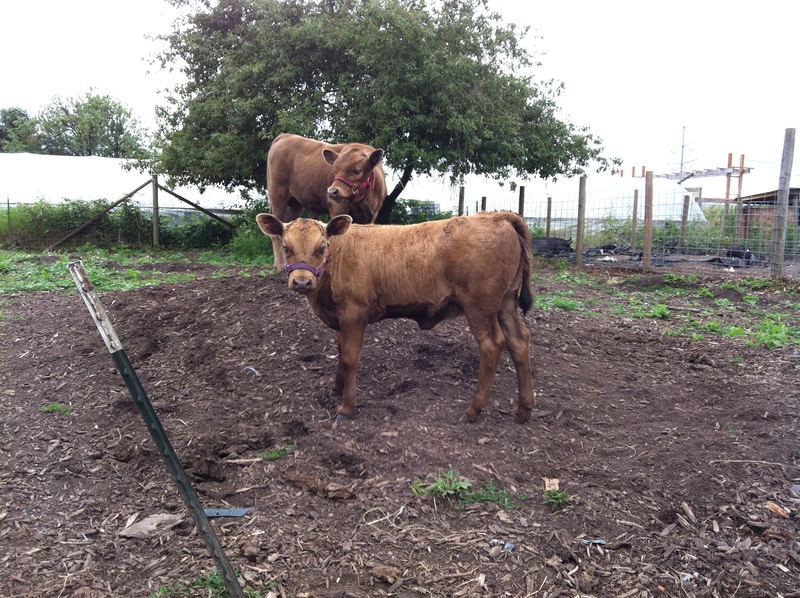 Cow manure, especially is the best possible fertilizer for vegetables. It has the right enzymes, beneficial organisms, and nutrient composition. And cows make a lot of it. We fill a pickup truck bed, heaping full every week! That goes a long ways toward fertilizing our growing spaces. Once the weather warms up and the ground is not so muddy, we’ll be planting annual grasses as cover crops and pasturing the cows on the farm instead of keeping them in the barn and paddock.